A 6t capacity spreader beam was the linchpin in lifting navigation skids onto offshore structures that guide vessel traffic and helicopters operating in Dutch waters of the North Sea. Centre of gravity was a principle area of concern in each lift due to load dimensions. The MOD 6 spreader beam combined with chain slings, wire rope slings, and attachment points that can rotate 360 degrees under load, to lift two 1.6t (1,600kg) skids from supply vessels onto each of three platforms. 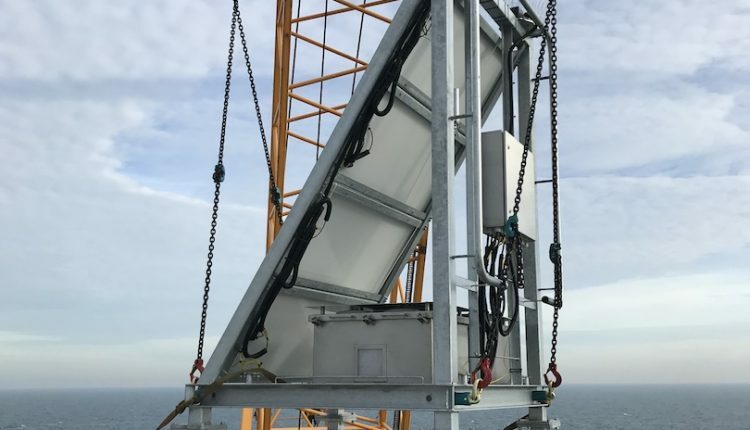 The same configuration also has been used to lift skids onto five other platforms last year and one offshore wind jacket in 2018. The base of the skids measure (approximately) 2m (6.6 ft.) by 2m and they stand 3m (9.8 ft.) high. They were lifted by crane onto the main deck where batteries were installed before being raised to the helideck and welded into place at predetermined positions. Jansen Marine & Offshore Trading BV, of the Netherlands, delivered the scope of work to U.S.-headquartered Tideland Signal. A number of oil and gas platforms will be abandoned in the years to come in the North Sea, before they are decommissioned. In the period between shutdown and abandonment and actual removal, they remain a hazard and need to be marked to avoid collisions. Since they do not have mains power after abandonment, Jansen Marine, in close cooperation with Tideland Signal Ltd, supplies skids that include marine lanterns, aviation obstruction lights, and fog signals; fog detectors; remote monitoring via satellite; and more. Robin Jansen, managing director at Jansen Marine, explained that the skids are essentially autonomous mobile platforms. They come in all shapes and sizes but typically are used for temporary marking of an offshore structure, such as a platform, monopile, or jacket. The company supplies several types of skids, with a distinction between a unit with or without photovoltaic (PV) modules. Both types are fitted with batteries, but only the one with PV modules is capable of charging them. Skids without such modules are commonly used for periods up to half a year versus the year-round utilisation possible with the more advanced system. An extensive scope of work included provision of lifting equipment, which connected to the aforementioned Theipa Point TP-F attachment points with female threads, manufactured by JDT in Germany and sourced from distributor Jansen’s stock. Two-legged wire rope slings were supplied by Mennens Groningen for use above the spreader beam while beneath, two-legged chain slings from J.D. Theile completed the rig. The chain slings had shortening clutches and safety hooks on both sides of the skid, allowing for fine-tuning the length of the slings and positioning of the centre of gravity. Robin Jansen’s father founded the original Jansen Marine Agencies in 1975. It became an agent for J.D. Theile in 1976 and remained so until 2011 when Jansen Marine & Offshore Trading BV was established and became a distributor.